Do you want to learn how to identify new forest pests invading our region? Do you want to learn long-term mitigation and management strategies for Hemlock Woolly Adelgid or Emerald Ash Borer (EAB)? Do you want to become involved in efforts to monitor pests, block pathways of introduction or locate EAB-resistant ash? If your answer to any of these questions is “yes”, you should come to the Invasive Forest Pest Workshop at Teatown Lake Reservation in Ossining. 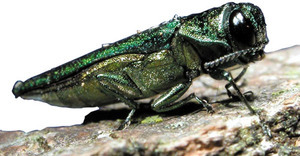 The workshop will include presentations on emerald ash borer (EAB), management, an opportunity to get involved in Managing and Monitoring Ash (MaMA), a citizen-science project to identify EAB-resistant ash, a talk on management issues of hemlock woolly adelgid and elongate hemlock scale, and an introduction to the Tree-SMART Trade approach to preventing future forest pest invasions. This workshop is open to the general public, municipal leaders and members of conservation boards. Continuing education credits for ISA certified arborists, NYS licensed pesticide applicators, and NYS Landscape Architects are available. Online registration available until noon the day before the event. If online registration is not available, call (914) 762-2912 x110 to register.